We didn’t report any false, skewed or compromised temperature data. Trust me, really we didn’t, I swear we didn’t. Maybe the logic of the AGW Folks is all of the activities cause Global Warming? Well, they are correct, incinerating garbage, paved tennis court, parking lots, conditioner exhaust, cell phone tower, barbecue grills and halogen light bulb all created by man cause Global Warming. It was the warmest day of the year, in Dallas/Fort Worth today. 99 degrees F. The linked site shows hourly temperatures and and even has a temperature chart. The high today was 99 degrees F, according to their chart. This seems petty, but one statistic often quoted “proving” global warning is how many 100 degree F or hotter days in a year. So 99 degrees F, not 100 degrees F is more important than it seems. Even though their own chart and hourly temperatures show it never got hotter than 99 degrees F, the temperature was reported as 100 degrees F. I guess they just thought it sounded better that way. Anthony Watts (Watts up with That) has done a project on this very issue. He and volunteers traveled around the U.S. to inspect every known reporting site. The results of his findings are remarkable. Probably close to 60% of all US sites are compromised in some way. Then there’s the temperature reporting from sites where there is no measuring equipment. The results are guesstimated. Amazingly these guesstimated readings are increased and used as proof of Gorebull warming. So. Seen some proof of Gorebull warming in Antarctica on the news lately? There are only a handful of measuring stations on a Continent that is 1.5 times the size of the lower 48. The temperature of the entire Antarctic is extrapolated from a few measuring stations. Some Antarctic “readings” are extrapolated from instruments which are actually thousands of miles away. I call it Antarctic temperature measurement by the BS meter. The sad part is that when you talk to some of these activist arctic scientists they actually have faith in their own make believe. Now this is something I can agree with, I am always complaining about the UK sensors, we have had multiple so called hottest day records set by the same sensor that just so happens to be in Heathrow airport besides a runway, never mind the urban heat effect of all the runway concrete, but its the busiest or one of the busiest airports in the world, all that jet engine activity with the urban heat effect from all that concrete is going to have a huge bias, yet the records are only ever y 0.1 or 0.2 degrees, not only is this just stupid but these sensors contribute to the so called average temps that are being used to claim the world is warming, ad have numerous airport sensors and it was only last week this happened again, before I knew the location of the record I told my wife straight away that will be Heathrow airport again I guarantee you and so it was! This same temperature record site is on the Northern Runway perimeter. It is affected by reverse thrust jet wash from very heavy, 4 engine jets, when the Northern runway is being used for landing from east to west, with a southerly cross runway airstream. This site generated last year’s peak summer temperature record when five of them landed in sequence at the exact time of the hottest period of the day, in exactly the same weather conditions, when in fact Kew gardens was several degree C cooler on that day. But then again the UK Met Office in eye deep in the NOAA fraud over AGW, using heat island records as its proof. Even their £90 million new super computer climate model has a 1.7C warmist bias in its modelling software. As well as its leadership team being fully paid up members of the Church of Global Warming, educated in the same East Anglia climate department which produced the alarmist hockey stick graph, which kicked off this alarmist bovine excreta. And then the warmists get excited when these sensors show that a new warmest year evah has been set by just two hundredths of a degree. This is not “new news”. The original article was published in 2010. I agree, but then it was dismissed as sceptical BS, now is a different ball game. The more the hoodwinked press discover just how badly they have been lied to by the warmists, the more they will investigate, and then tear the Warmists to pieces over the next 4 years. Each Grands Solar minimum takes about ten years from the start of the first cycle in the minimum before its climate effects are locked in the fossil records. Those effects are cold harsh winters on the centre and east sides of major continents, and on the prevailing wind side of the major continents cold, wet and very windy. This is a documented fact of several previous GSMs with the research starting with the LALIA GSM from 558 to 600AD. I read a story about this 12(?) years ago. One of the very first articles I read on climate science. It is one of the reasons I don’t believe in global warming, etc. There are many problems with our monitors, location, size, color, and even the size of the slats that let air circulate. None of those things matter, if they are the same across the country, but when there are differences the data accumulated is virtually worthless. It can’t even be adjusted when the errors are fixed because there is no way to compare the new data to the old. Anthony Watts has been exposing this for many years. It is not a new story. But it never hurts to have more people verifying what has been said before. thanks for the update! Now I know which ones to disregard in CA. And I’m sure there are far more bad sensors across the country – such as those located right above black asphalt at airports, inside parking garages….etc. I’ve heard a report a coupe years back in the UK somewhere where they reported the highest temp ever in summer – only to be disregarded later because it was found that the sensor was directly affected by hot jet exhaust! The biggest town ( population of 13,000) near me had 30 years of their temperature record out of the years since 1892 taken for from a post office building (in a low lying area) where the thermometer was placed on the second floor of the building. Now it is up on the highest ridge top around and near their airport landing strip since the 1960’s. Because valleys and mountain or ridge tops can vary considerably on a day-in and day-out basis over very short distances, moving a thermometer at all should mean you have to start the temperature record for that area all over again. Just me I guess. They have moved their “official” thermometer four different times over the years since 1892. Actually, I first heard about this problem in a physical geography class in 1984. Yes you have, but He or She who guards the climate data, is the primary person to ensure that climate records meets the evidence requirement of an ever increasing temperature rise and ensure that Carbon Credits do what it is designed to do, which isn’t to provide funding for the third world, but crash the financial economy of the Globalised world. Its very simple without Credits in the shape of £, $, Euros etc. There is no fuel, food, energy or water in the taps. Even modern cash is made out of base metal, – steel which rusts on the floor. Kids used to find copper coins, drop them in a mild acid and they are as good as new. You won’t find any of the steel coins in the same way after years in the ground, as they will have rusted away. The world’s hydrocarbons are too valuable to waste on the capitalist consumer economy, even better if that scarce resource is made to last for the next 1000 years, particularly if the world population was reduced by 97%. It would go far longer. Even better, without Western interference Africa would return to the wildlife haven it once was, and its remaining humans reduced to Stone Age hunter gathers. This would make it much easier for the remaining Technological educated socalist Greens to migrate south once the True Ice Age recommenced, and that is not far away, perhaps as long as the Third Reich was supposed to last for. 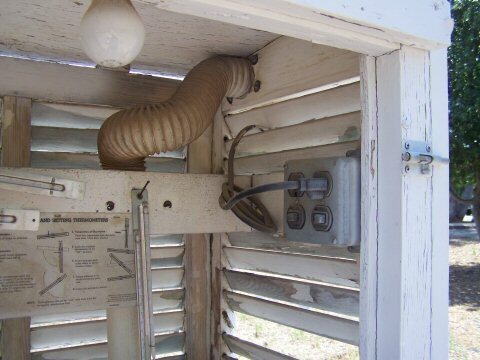 I remember one of the seeming minor points from the station survey that criticized painting the enclosures with white latex paint, rather than white wash.
Latex paint absorbs considerably more UV radiation than does white wash, thereby increasing the temperature inside the housing by one to three degrees. The unintended consequences of modernizing maintenance technology has skewed the temperature records.